Join us for this groundbreaking documentary film that pulls the curtain back on the untold story of fast fashion, followed by a panel discussion with panelists from Beijing’s sustainable fashion industry. 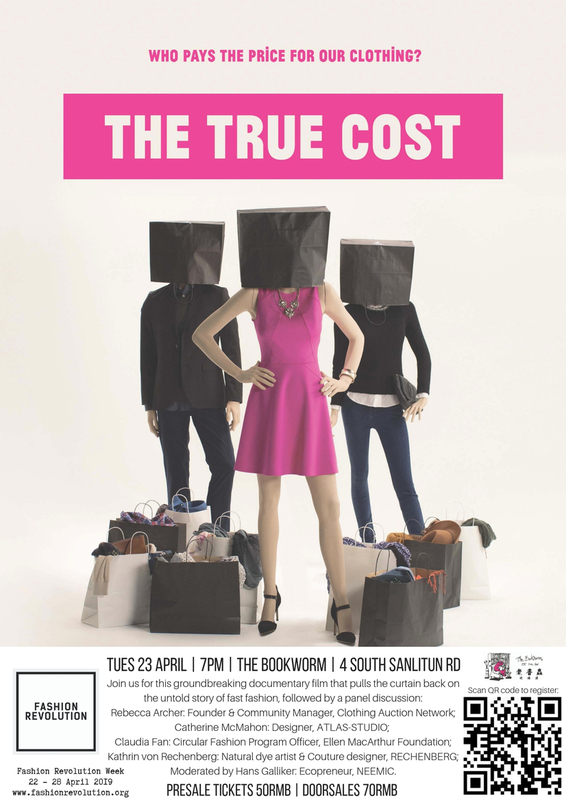 The True Cost, a documentary film about clothing. It's about the clothes we wear, the people who make them, and the impact the industry is having on our world. Filmed in countries all over the world, from the brightest runways to the darkest slums, and featuring interviews with the worlds leading influencers including Stella McCartney, Livia Firth, and Vandana Shiva, The True Cost is an unprecedented project that invites us on an eye opening journey around the world and into the lives of the many people and places behind our clothes. Join us on 23rd April to learn about how you can use your power as a consumer to vote for ethical and sustainable clothing. Arrive at 7pm, documentary screening at 7:30pm followed by a short discussion.